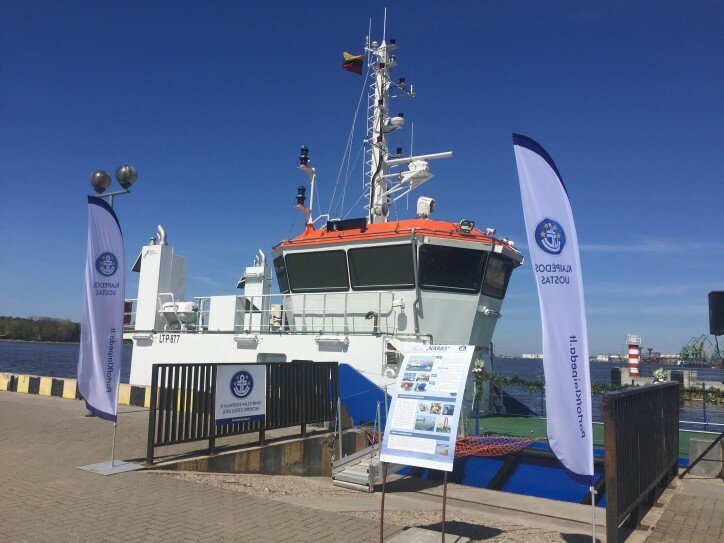 Klaipeda State Seaport Authority held christening ceremony for its new oil response and diving support vessel - "Naras"
The new oil response and diving support vessel "Naras" acquired by SE Klaipeda State Seaport Authority has been christened solemnly according to all naval traditions. This modern vessel will allow to assure more efficiently the implementation of nature protection requirements and proper technical maintenance of maintenance of port waters and access to it. When the vessel was consecrated by the Bishop of Telšiai Diocese Kęstutis Kėvalas following all old traditions, the sacrificial bottle of champagne was broken over the bow of the vessel. The seafarers believe that this ritual protects a vessel from accidents. 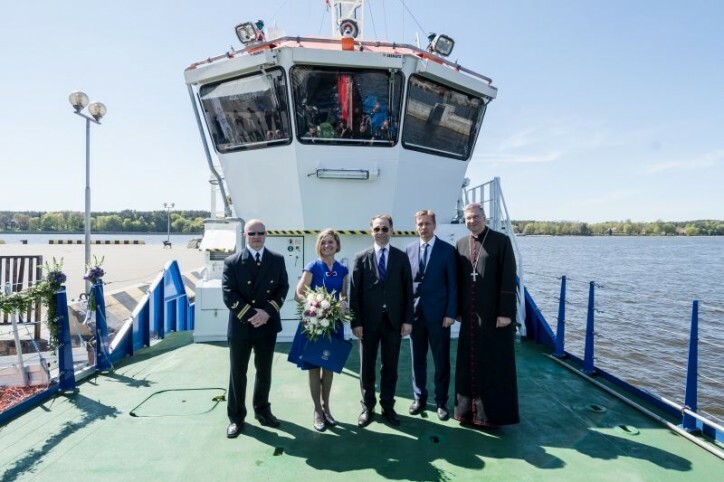 This mission was entrusted to the Godmother of the vessel – the head of the Carrier and Communication Department of Lithuanian Maritime Academy Genutė Kalvaitienė. "I would like to wish the successful and safe activity to the vessel "Naras" and her crew for the sake of reliable Klaipeda Seaport", wished the Godmother. The Minister of Transport and Communications Rokas Masiulis that was among the participants of the ceremony in his welcome speech expressed the belief that the vessel would be a good contribution to benefit our country. "Over thousands of years ships used to carry us to open seas , supplied us food and saved our lives, therefore this christening ceremony is a very important event. It is the launching of a vessel, that will further assure the implementation of all these vital things and that our sons , our brothers and people that are dear to us will return safe and sound and bring us all those things that they went to the sea for", told the Minister of Transport and Communications Rokas Masiulis. According to Director General of Klaipeda State Seaport Authority Arvydas Vaitkus this vessel will allow to perform better and more rapidly and efficiently the subsea technical works and supervision in Klaipeda Seaport and access areas. "Usually people can see obviously only the water surface in the seaport, but the entire philosophy and elaborated hydro technical facilities are hidden under the water. The divers activity and surveys are extremely significant every day work. In order to provide the streamlined Seaport activity we must constantly be ready to assure the necessary depth and to remove the possible obstacles in the port waters or alongside the quays. The new modern and innovative vessel will allow us to assure more efficiently navigation safety in the Seaport", told Director General of Klaipeda State Seaport Authority Arvydas Vaitkus. The vessel is equipped with diving operation management room and a pressure chamber, providing the possibility for divers to perform safely works in deeper waters (even up to 50 meters). "Naras" will perfectly serve as nature protection instrument as well as in the event of an oil spill the vessel can respond to oil spills and collect garbage spread on the water surface. The vessel‘s bow is equipped with a crane for removal of bottom obstacles. The length of "Naras" is 23,2 meters and the width is 6 metres. Maximum draught is 1,52 metres. The vessel can reach the speed of 11,5 knots. „ Naras“ entered the Seaport in December of 2017, presently it has been entirely commissioned and is performing operations successfully. The captain, engineer and a motorman are the crew members of the vessel, the team consists of three divers that are constantly on the watch. Vessel "Naras" was built in Estonia, in "Baltic Workboats AS" shipbuilding yard and her price was 2,895 million euros. The name of the vessel "Naras" was selected by the employees of the Seaport Authority. At present, the fleet of the Seaport Authority has 7 vessels: two diving support vessels, three pilot boats, hydrographical vessel and rescue boat.